This low carb recipe is creamy and super yummy with the right amount of spices and a bit of kick! If you like creamy soups half as much as I do, you will love this satisfying dish. It’s the perfect meal for the Fall season..and it’s very KETO friendly. This savory recipe will have you looking forward to leftovers. The goat cheese is a perfect addition to the soup and your taste buds will jump for joy from the cayenne pepper kick. Here is everything you will need to make this Fall dish. 432.0 Calories, 38.0g Fats, 8.0g Net Carbs, 8.5g Protein. Slice peppers in half and de-seed them. Using the broil setting on your oven, place them skin side up on a foil-covered baking tray for 10-15 minutes or until skin is charred and blackened. While the peppers are roasting, cut cauliflower into bite size florets. Use 1 tbsp. olive oil, salt, and pepper to season the cauliflower. Roast cauliflower in 400F oven for 30-35 minutes. I used the convection feature on my countertop oven to cut the time in half. Once peppers are done, remove from oven and place in a container with a lid, or a food saver bag and seal. Let the peppers steam to soften while cauliflower roasts. Remove the skins from the peppers by peeling off carefully. In a pot, heat 2 tbsp. olive oil and add diced spring onion. Once spring onion is slightly cooked, add seasonings into the pan to toast. I didn’t have any spring onions on hand, so they were omitted from my dish. Add chicken broth, red pepper, and cauliflower to the pan. Let this simmer for 10-20 minutes. Add the cream, goat cheese and heat. Use an immersion or other blender and mix all the ingredients well. Make sure that all fats are emulsified with the mixture by the time you’re finished – about 1-2 minutes. The mixture should have a creamy consistency. Season to taste. Garnish with extra thyme and spring onion and enjoy your sensational low carb dish. Check out these other KETO recipes HERE, HERE and HERE. Hi Lynn! 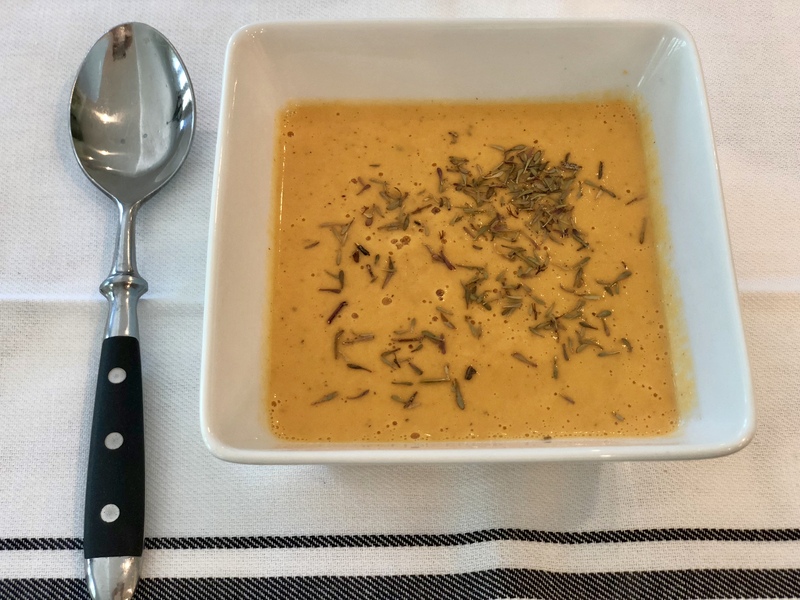 This soup really hits the spot, a good Fall comfort food..but low carb.